If you live in Auckland, when it comes to rubbish collection and waste management you might have heard of pay as you throw (PAYT) or prepayment management for rubbish collection. Although the concept of pay as you throw is a well-established method for waste management, the general public might not have a clear idea what it is and how it works. Therefore, at Authenticate, a technology hub that provides prepayment systems and pay as you throw solutions, we decided to explain the system and benefits of the system for users, councils and the environment. Pay as you throw (also called unit pricing or user-pay) is a usage-based model of pricing for rubbish collection and waste management. PAYT dates back to the early 1930s, but the modern implementation of the system can be traced back to 1970 in California, New York and Michigan. PAYT was first introduced based on three guiding principles, economic principle, social principle and environmental principle. From an economic principle, by removing waste collection and disposal from the rates, councils were able to have more freedom and offer fairer pricing to residents in each city. This allows rubbish collection and disposal to be treated the same as water and electricity and therefore users pay for what they consume (or in this case throw away). Socially the cost of waste management is distributed more fairly through the society, everyone pays for the waste they generate. In the previous model where everyone was charged the same amount on the rates, regardless how much they used the service, the cost was not fairly distributed. 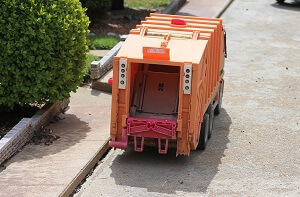 For example, a resident who is traveling for a good part of the year might have far less waste generated compared to a family of 5, but they could be paying the same amount on the rates for waste collection. Research shows that pay as you throw encourages reduction of waste production and recycling at the same time. Research by Biliewski (2008) shows clearly that PAYT reduces the load of landfills. Data supports that PAYT is an incredible tool to help reduce waste and help the environment; Data collected by Kelleher, Maria, et al. shows pay as you throw resulted in reduction of waste in North America by 38% and increased in recycling by over 40%. Also Recycling Today reports that in the South Main, USA, areas with PAYT system implemented produce 44.8% less waste and have 62.3% higher recycling rates compared to the areas without PAYT. What does PAYT have for me? Pay as you throw is not just an initiative for the environment, although as residents in New Zealand we cannot do enough to conserve and keep our beautiful country. PAYT is designed by having residents in mind, in multiple areas. First is the cost of waste collection, by implementing an automated pay as you throw system, each household is only paying for the rubbish they generate and is not bound by a fixed rate. If you think about it, during the year there are times that you are not home or do not have as much waste but because you are paying a fixed rate tax, you are charged the same as the others for what you do not use. There are multiple methods for PAYT implementation, the best approach is using automated payment methods and this technology exists in New Zealand. Using RFID and prepayment management system that dramatically simplifies the process, an online prepayment system can allow you to pay using your mobile, a computer or a tablet; it also allows for payment over the counter, at certain retailers and even dairies. The combined level of convenience and savings resulting from PAYT implementation, as well as tremendous environmental benefits, are the reasons councils are moving towards pay as you throw at this pace. To learn more about how Authenticate is technologically able to support PAYT, visit our pay as you throw for waste management page or prepayment systems for rubbish collection page. We hope that our combined efforts together with every other citizen, leads to a better future for every New Zealander.